Before a bit of a hiatus, Supergirl thought it prudent to move their main plot along just a tad. Good decision, guys! 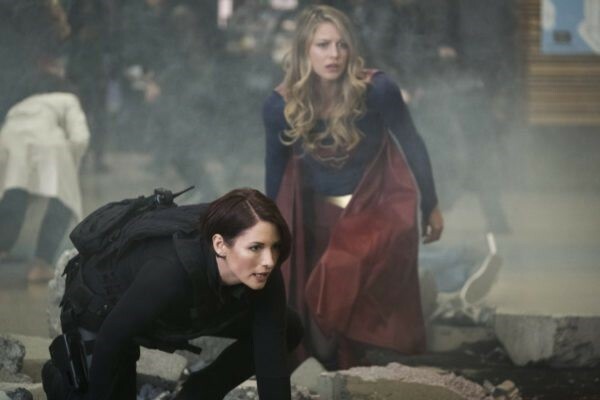 Certainly better than the filler you threw at us last week, though this one had its own elements of frustration — mostly its decision to paint Alex Danvers as a trigger-happy agent with a vendetta and... I don’t know, a fear of loneliness? I’ve noticed that Alex occasionally acquires these negative traits whenever the writers really need her to clash with Kara on some level, and it never fails to annoy me. Especially since it usually comes out of nowhere. Alex hasn’t had much of an opinion on the Worldkillers. She took Reign beating her sister to a pulp admirably well and even shrugged off Reign breaking the heck out of her leg in a fight, but suddenly holds an instantaneous grudge against anyone vaguely associated with the Worldkillers. Okay, sure Supergirl. I do think you’re rushing through some stuff in order to get to your vacation, though. Team Supergirl is zeroing in on the Worldkiller Kara picked out of a lineup out in the previous episode, but it turns out that Worldkiller is just a lady who really likes listening to Lisa Loeb while sitting in the middle of her living room. That’s pretty weird, yeah, but it’s not exactly devious. And you can’t blame a lady for her music listening predilections, people. Or, specifically, Alex, since Alex spends this entire episode being bizarrely biased against this one person — to the point of triggering her Worldkiller transformation by being hostile. I repeat: this woman, Julia, was just listening to music in her home when Supergirl and a bunch of black-clad agents barged in and started attacking her? So I know Julia has a world-conquering Kryptonian genetic experiment inside her, but I’m sort of on her side in all of this. I don’t think it helps that we know for certain the Worldkillers do live double lives, so Julia Freeman probably is just a normal person who gets triggered into being a killing machine the same way Sam is a normal person who gets triggered into being a killing machine. The episode doesn’t examine what the differences are between the Worldkillers (why is it that Purity’s eyes stay silver when Sam just gets a brief flash of red? Why does Purity taunt the team while Reign is very straightforward and almost robotic in her mission?) but maybe that will come later. Hopefully. There is a lot of story in this plot that I have a feeling the show is going to squander, despite having ample time to really dole out the information well. After Alex yells and points a gun at poor Julia, Julia gets freaked out enough to expel a force that knocks everyone to the ground. J’onn is able to cuff her and they take her to one of the DEO’s glass door prison cells for interrogation. She is indeed the Worldkiller who calls herself Purity, but she’s not eager to give up any information on the Worldkillers or their plans. Kara is adamant that the Julia alter-ego was not an act, but Alex thinks it was all a trick because those tricky Worldkillers are always doing tricky, tricky things in order to trick Supergirl. Except... nope. Not even a little bit. Based on the information the character has about Reign, there is no reason for Alex to presume a Worldkiller is adept in subterfuge or would have any reason to use it. Reign has never appeared to feign innocence or human weakness, so why would Alex think it was something in the Worldkiller repertoire? From Alex’s perspective, with only Reign as a reference point, the Worldkiller is a single-minded Terminator with a black-and-white understanding of justice and law. Considering Reign’s vendetta against all things insincere or unrighteous, she should even go so far as to think the Worldkillers can’t lie or are morally against lying. So Alex’s paranoia over Julia/Purity tricking Kara? And her refusal to allow Kara to treat Julia with respect and hope? Kinda stupid and clearly something the writers tacked on to increase drama. Supergirl, this sort of thing is why I just don’t understand you. Alex is not a paranoid, trigger-happy person with a lust for Worldkiller blood. Even right after Kara’s beat-down by Reign, Alex wasn’t so full of frothing rage, so this sudden fall into hateful vengeance just seems false. I know it gets hand-waved later as the culmination of her complicated feelings over the Maggie breakup, but that barely smooths over the rough edges of this characterization. Even the established mold for the Worldkiller persona got broken in this episode, since Purity does taunt Alex and Kara and acts like a more typical villain, whereas the Worldkillers are meant to be something on another level entirely. This, like Alex’s personality in this episode, is a case of the writers putting drama ahead of character — so they shattered their cool, stoic, interplanetary dispensers of justice in order to make it happen. That’s incredibly unfortunate, since the concept of all-powerful, strict and violently, robotically moral Worldkillers being brought down by hope and love — the two things Supergirl most strongly represents, and what I’m pretty sure will be their downfall considering the whole Ruby thing with Sam and Purity’s brief recognition of Julia’s best friend — is something just cheesy and wonderful enough to be perfect Supergirl fodder. Most of the episode is spent trying to get info out of Purity and failing. Purity says a couple mean things to Alex and suddenly Kara’s given up on ever getting through to Julia (this episode is annoying). Since Kara “underestimated” the true evil of her foe, Purity escapes the DEO and starts terrorizing the city — starting with the subway, where she gets Kryptonian whispers from, I assume, the evil AI. The fight in the subway station proceeds as one would expect — lots of destruction, people screaming, the usual — and Purity actually gets the jump on Kara. In a twist literally everyone saw coming, Alex turns in her opinion of Purity’s-not-Julia so she can talk Julia back into taking control of her body and not killing Kara. It’s successful, but then Reign shows up and Julia trades herself for Alex’s life. Reign promises that they will find the third Worldkiller, Pestilence, and they will be unstoppable. After Reign flies off with Julia, she deposits her in the Fortress of Evil and the AI “awakens” her, which Julia ain’t so happy about. Meanwhile, Team Supergirl brainstorms how to stop the Worldkillers and Kara posits a radical new idea: they don’t stop them. Instead, they save them. In a heart-to-heart with J’onn, Mon-El admits that he and Imra didn’t get married out of love, but because of a political strategy to unite all the future people. He compares the logical, strategic relationship he created with Imra with the completely illogical relationship that happened with Kara, calling himself a “self-absorbed misogynist” who learned to be better. Ah, Mon-El. I see you’re conveniently leaving out the part where you and your family kept slaves, bro. You were a little bit worse than a womanizing jerk. Lena says she “knows what’s wrong” with Sam after Sam snaps and briefly flickers into Reign mode. That’s... intriguing. I think Lena saw Sam’s red-flicker eyes, but I don’t know how that would clue her into anything that’s actually wrong. Racking my brain for any time on this show where Lena might have seen red flickering eyes, and I’m coming up with nothing. So at the very least, I’m curious to see where that goes. Imra’s on a secret mission! Even Mon-El doesn’t know about it! That said, I don’t fully buy that Mon-El knows much of anything. Hey TV writers: there’s no such thing as speed dial anymore. Way to make yourselves look old.